New York Mets pitcher and Cy Young candidate R.A. Dickey, 37, has transformed himself as a knuckleballer and is enjoying a late-career resurgence. That much you already knew. But do you want to know why I really love watching R.A. Dickey pitch? This is the second time he’s had to reinvent himself. 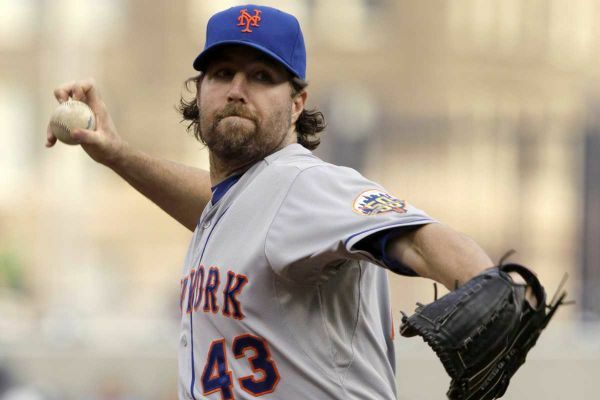 Coming out of college, Dickey was a hard-throwing righty out of the University of Tennessee. For the Volunteers, he fanned 345 pitchers in three seasons*. The Rangers saw enough potential to draft him 18th overall in 1996. *He also majored in English literature and earned All-SEC Academic honors. Seriously, what’s not to love about this guy? That’s where R.A. Dickey’s story starts to get weird. 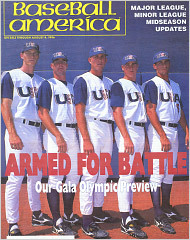 Before signing Texas’ $810,000 contract offer posed for a Baseball America cover (he’s second from the left) with other Olympic team pitchers. A Rangers doctor noticed Dickey’s arm hung awkwardly, and checked it out. The physician discovered that Dickey was born without his ulnar collateral ligament. The UCL connects the ulna to the humerus and is probably the most important ligament in a pitcher’s arm. Dr. Frank Jobe and Dr. James Andrews have made careers out of replacing the UCL in the Tommy John surgery. There’s an All-Star roster of pitchers who have gone through Tommy John, some even multiple times. R.A. Dickey is like the Ferrari that came off the assembly line missing a timing belt. His elbow shouldn’t work. But it does. After the Texas doc found out about Dickey’s missing ligament, the Rangers’ offer dwindled to $75,000. “Imagine winning the lottery and then losing the ticket,” said Dickey, who signed with the Rangers because he assumed no team would give him a chance again. He reported to the minor leagues knowing that precious little was keeping his elbow together, that each day pitching could be his last. Despite the major blow to his confidence, Dickey worked his way through the minor leagues, debuting with Texas in 2001. He threw a below-average fastball, but had developed a wicked sinker he called “The Thing.” It was a sinker/forkball/knuckleball/whatever else he could put on it. At this point in his career, he was basically pitching more with his guts than his arm. After a bit of success in 2004, his time in Texas started to fizzle out. He tried the knuckleball in 2005, but success was fleeting. After he gave up six solo home runs in one game, he was demoted to AAA. He bounced around from Milwaukee to Minnesota before being selected in the Rule 5 draft — a haven for hard-throwing and toolsy youngsters who have yet to break the Majors — by Seattle. He went back to Minnesota later, but his stats suggested nothing special. Then, he started to master the most difficult pitches in baseball. He signed a minor league deal with the Mets in 2010, and appeared ready to make his mark (again) in The Show. In 2010, Dickey was tied for second on the team in pitching wins above replacement to Johan Santana. In 2011? Again, second in pitching WAR. But this year is truly remarkable. Even before tonight’s one-hit shutout — second in a row — Dickey was the most valuable Mets pitcher. The last best knuckleballer, Tim Wakefield, had his best year in 2003, a 3.9 WAR. It’s not even halfway through the season, and Dickey is on pace to surpass that (2.1 fWAR before tonight’s game). He could be having the one of the best years ever by a modern-day knuckleballer. WAR wasn’t readily available before the 70s. *Phil Niekro finished sixth in Cy Young voting that year to Gaylord Perry, who posted a 5.8 fWAR. Watching R.A. Dickey pitch two consecutive one-hit shutouts and become a leading candidate to start the All-Star Game and possibly win the Cy Young (he’d be the first knuckleballer to do so), has been purely amazing. He has determination, grit and he’s a pretty good writer, too. I always love watching pitchers who could dominate without a 98-mph fastball. Dickey is dominating with a pitch that’s impossible to predict, putting up statistics more befitting a fireballer. I can only hope it continues.